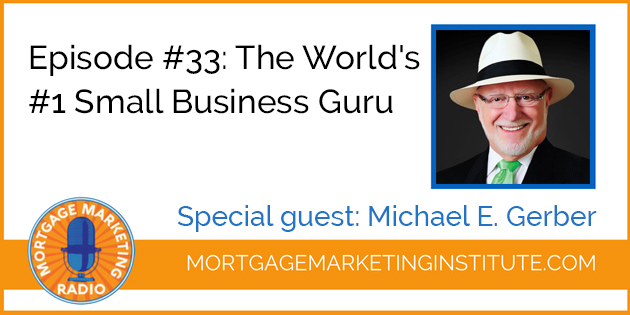 Our special guest for Mortgage Marketing Radio this week is Michael E. Gerber. calls Michael E. Gerber “the World’s #1 Small Business Guru.” He’s an entrepreneurial and small business thought leader who has impacted the lives of millions of individuals and hundreds of thousands of companies worldwide for over 40 years. As Michael states during our interview, what we do in our in our job activities is not about the day-to-day stuff. The opening and closing loans, meeting with real estate agents and it’s not about just making money. Michaels conviction is that our work needs to be about something more, something bigger. Without purpose and meaning, the routine activities eventually burn us out and it never becomes enough. We don’t want to spend a lifetime doing something that doesn’t give our life meaning. Michael is the author of the mega-bestseller “The E-Myth Revisited” and five other E-Myth books concerning small business and entrepreneurship. Michael has also created an immersive experience called The Dreaming Room: Design, Build, Launch & Grow™ Through the Dreaming Room, Michael helps entrepreneurs and business professoinals discover the means to create a new company, or transform an old one, while going to work ON his or her business and life, rather than just IN it — unfailingly reflecting his or her transformational resolve into the actions needed for a company and ones life to flourish.